Richard Hough, a family man from Brewood, Staffordshire, was made redundant after many years of working for a local fencing firm and was struggling to find further employment. 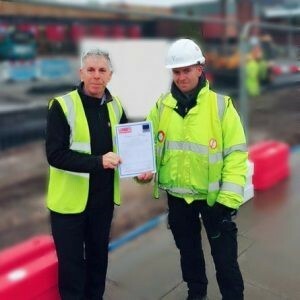 Harvey Lawrence, a leading construction recruitment agency, helped him to find work in the Staffordshire area. Richard demonstrated his passion and determination to succeed in this sector so they supported him to retrain and further develop his skills. As a result he has now obtained his Traffic Marshall/Banksman certificate and has successfully secured a long term contract. The construction industry is still suffering from a skills shortage and therefore Harvey Lawrence are keen to work with motivated individuals who wish to work in the sector. Richard is a great example of this and hopefully is an inspiration to others to retrain.